Pictured above: our ninth and tenth graders on the first day of school this year, back in September, geared up and ready for our annual camping trip. 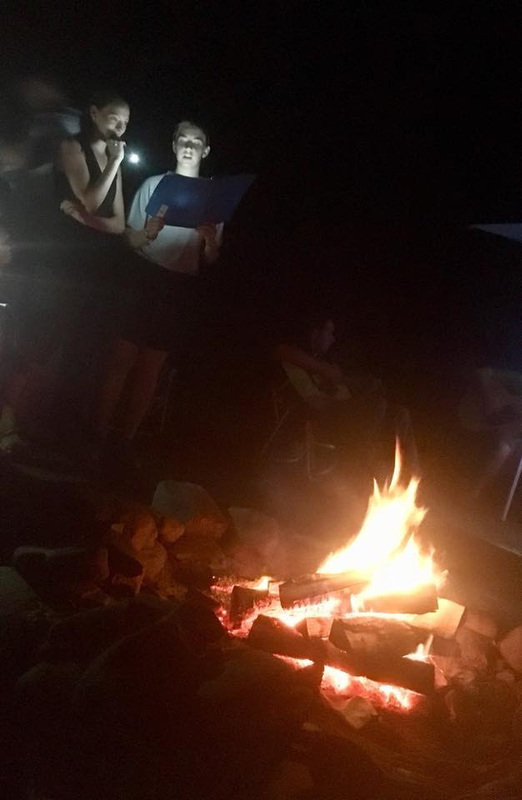 Pictured below: singing at a campfire on that trip, just a few days later. All these beautiful faces are in my mind as I study and pray over this recent interview with Cardinal Robert Sarah, a Vatican prelate from Guinea in West Africa. In the interview, +Sarah describes the current spiritual situation in western civilization. It's a stunning, no-holds-barred, prophetic diagnosis of our culture. It's also the context in which our children are growing up. "...everything is prepared for a renewal. I see families, monasteries, and parishes that are like oases in the middle of a desert. It is from these oases of faith, liturgy, beauty, and silence that the West will be reborn....We have simply to live our Faith, completely and radically....I call upon Christians to open oases of freedom in the midst of the desert....places where the air is breathable, or simply where the Christian life is possible....places where truth is not only explained but experienced. In a word, we must live the Gospel: not merely thinking about it as a utopia, but living it in a concrete way. The Faith is like a fire, but it has to be burning in order to be transmitted to others. Watch over this sacred fire!" Martin Saints exists to kindle this sacred fire in our children, to give them an experience of the lived Catholic faith that is beautiful, compelling, and persuasive. Martin Saints is also a place where adults can collaborate as teachers, parents, donors, prayer partners, and volunteers, so that all of us experience a sacred oasis, a place where the air is breathable, a hearth where the sacred fire burns. It's hard work sometimes. If Cardinal Sarah's analysis of our culture is even half-right, nobody - no individual, no community, no relationship - escapes the stresses and strains arising from what he is describing. When our culture isn't right, the ripple effects in our daily lives can be discouraging. But this is what it looks like to become a saint and seek holiness in our time and place: to persevere even when things get hard, and to perceive what we're doing in this school as an offering for the renewal of the Church, an investment in building community, a long term commitment to tending the sacred fires. Lent is nearly over. I hope we're all finishing strong. It might be time to reconnect with our Lenten disciplines, our commitment to prayer, confession, and almsgiving. What is Jesus asking us to do? The recipe for renewal and a good Easter is no secret: tend those sacred fires! Are we the right school for you? We’d love to meet you! You can email headmaster, Mr. Adam Dickerson, or our board president, Deacon Christopher Roberts, anytime. They are eager to hear from you!